Yuichi Kinoshita, leader of the Kinoshita Kabuki Company, looks back on the activities of the "The Power of Tradition, the Form of Artistry" program and shares his hopes for the future. Q1: Could you tell us your thoughts as you look back on your activities during FY2016? We conducted fieldwork in Indonesia in September, and prior to leaving we held several study group sessions. Once you leave education and join the world of work, you lose almost all opportunities to attend lectures by experts and to experience the happiness and fulfilment that come from study. I am truly grateful to have had this opportunity once more. As I had virtually no knowledge about the performing arts in Indonesia, the study group gave me a chance to learn. What's more, when I compared the study group to my own activities it made me think about my own lectures on Japanese classical performing arts and whether holding study groups in this manner would help to spark interest in the topic. It also made me realize that it is difficult to keep up when you are suddenly bombarded with a lot of new and unfamiliar words and terms. To find myself back in the position of being a novice in the performing arts was a truly meaningful experience. Yu Endo of the Japan Foundation Asia Center gave us a lecture in which he used a quiz format to help us learn facts and figures about Indonesia, which not only helped the information to sink in, but also was very enjoyable. These study meetings provided me with insights that later aided our fieldwork because they enabled me to experience firsthand such questions as: What things do you tell beginners? How do you convey them? What things should you take particular care with? Yu Endo giving a lecture about Indonesia. 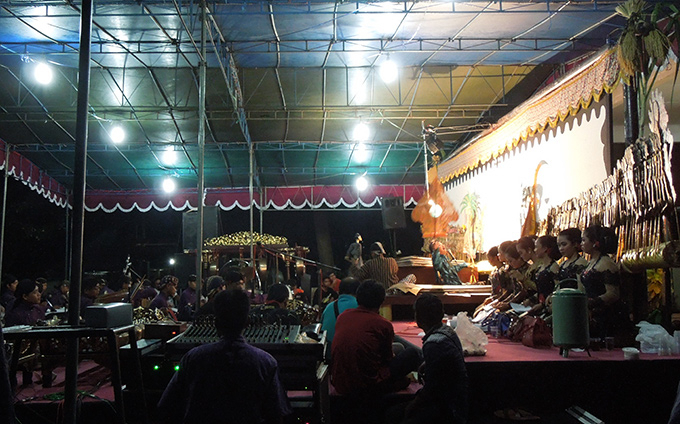 A sense of the "living nature of performing arts"
Next, we embarked on the fieldwork in Indonesia. While there, one of the things we did was to see Indonesia's performing arts live and really get a feel for them. Watching these performances gave me a fresh sense of the "living nature of performing arts," which is something that you don't really get a sense of in Japan. Looking back at historical records of classical Japanese performing arts we can see that in the Edo Period (17th-19th century), it was standard practice for Kabuki performances to continue from sunrise to sunset. Apparently, during the performance the audience's attention wasn't always fixed on the stage. Instead, they acted freely―having something to eat, taking a nap, talking among themselves, ignoring the sections they found boring, and wandering around the seating area. Although I could just about imagine how this would be, for a long time it puzzled me as to how the audience of that period perceived the performance, but when I saw a wayang kulit shadow puppetry show in Indonesia, it all became clear to me. I thought then that this was probably how audiences in the Edo Period had perceived the performance. I watched several wayang performances one after the other for more than six hours. Even though the performances continued for such a long time, it didn't detract from the atmosphere of the space and everyone enjoyed themselves in their own way. You can see the stage from all angles. You can have something to eat while watching. There is a special atmosphere and different smells are floating around, and there is also space to relax. You truly experience the performance with all five senses. This really brought it home to me that this is one way of enjoying performing arts. As the performances are free to everyone, I think that if I had been born in Indonesia I would not have found a job, but instead would have become a night owl who watches wayang every evening (laughs). It was an incredibly valuable experience for me. When I returned to Japan it changed the way I watched bunraku performance, helping me to relax in certain scenes and focus on others, and also become aware of my own breathing. I found my body starting to move in time with the gidayu-bushi narrative of the performance, which made me stick out in the audience (laughs). This sense of watching a performance with your whole body is something that changed after my experience of wayang. Now that I know the tremendous fulfilment that comes from that approach, I find that after a performance it is not just my eyes that are tired, or at the very least I no longer watch a show using only my eyes and ears. Experiencing wayang kulit made Kinoshita realize that you experience performing arts with your entire body. Another big thing about our fieldwork in Indonesia is that we encountered so many people. We met various artists and people involved in the performing arts, all engaged in a variety of fascinating activities. I was able to discern links to my own activities, and while there were some things I found very inspiring, there were also others I didn't understand. However, as I look back now, all of these experiences were valuable. Although these people are focused on different aspects of performance and art, they all share the same love for their craft and what they do. It is precisely because each person is devoted to a different aspect of art that results in a diversity of expression. It is not a question of whether something has merit or not, but rather that you can see the various ways in which love is expressed, that is all. I only spent about two hours with each person I met, but even in that short time, I was able to share with them a fervor for the arts. What came out of these meetings was a sense that there should be more diverse possibilities for the arts; that the environment surrounding traditional arts is rapidly changing and there is also a feeling that the contemporary and the classic are becoming more detached from one another; that we need to do something, but is it the arts that need to do something and is it the arts that need to be cognizant of the contemporary? My perception was that all the people I met had this sense and are all engaged earnestly in their various activities. Another thing I found was that artists in Indonesia are not full of their own self-importance. For them it is simply the case that they enjoy doing what they do in the world of the arts. 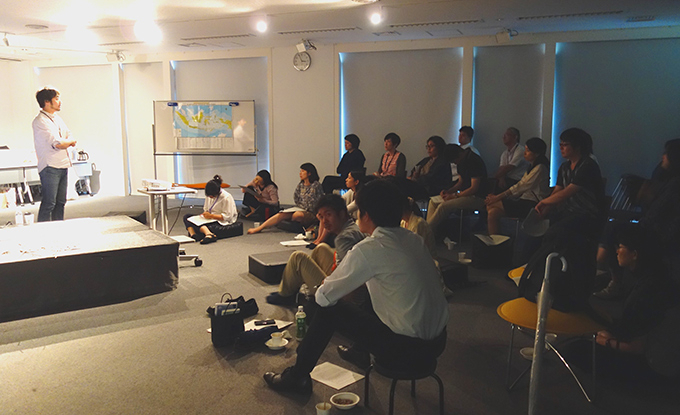 L: Kinoshita talks about his experiences in Indonesia while leafing through illustrations by Haruna Tokimatsu (painter/illustrator), another program participant. R: Daily life in Indonesia from Tokimatsu's unique perspective. 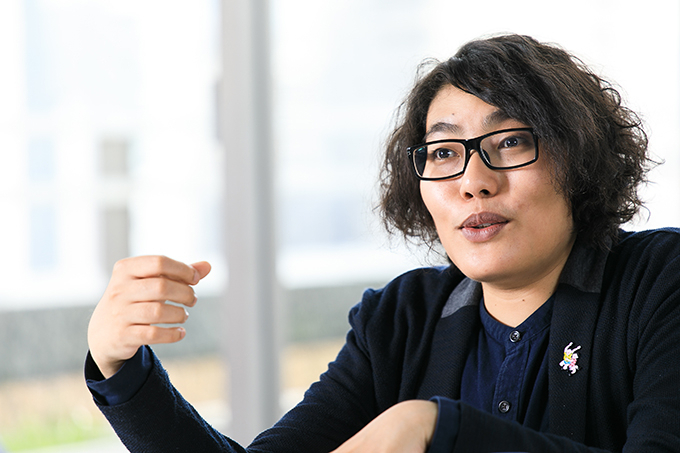 I really enjoyed my conversation with Natsuki Ikezawa. We spent a great deal of time talking about the acclaimed modern retranslations of classical literature in "The Complete Works of Japanese Literature" published by Kawade Shobo Shinsha Publishing, which was edited by Mr. Ikezawa, and we found ourselves to be in total agreement. Mr. Ikezawa has presented a significant model for contemporizing the classics. I got the feeling that it is our predecessors that empower us to continue our work. What made the greatest impression on me was what Mr. Ikezawa said at the end of the conversation, that above all, the ultimate thing for contemporizing the classics is "love." This was truly inspirational. If it were me who emphasized the importance of "love," the reaction I would get would be something like "Of course you'd say that because you're really into the classics." This was completely different from when Mr. Ikezawa spoke the word "love" at the end of our conversation, which was really profound. When you speak of "love" it may sound a little idealist, but I believe that ultimately it is love that creates all things. This is precisely because love has different forms. While I was in Indonesia I thought about the activities I saw there in the context of whether I liked them and whether I could relate to them. Then, when I returned to Japan and had the talk with Mr. Ikezawa, he spoke the word "love." When I then looked back on my experiences in Indonesia, I realized that what I had seen was "love in its various forms." 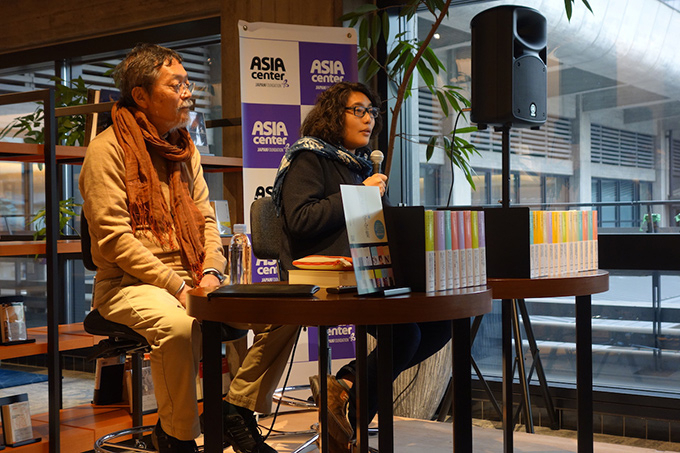 Natsuki Ikezawa and Kinoshita holding their talk at ROHM Theatre Kyoto in November 2016. Q2: What have you gained through the program? In the past it was the case that when I saw someone else's work I would either love or loathe it. I was the type of person who would analyze why I disliked a certain work or performance, but I think that I am more accepting and tolerant now. Perhaps that is thanks to my various experiences over the last year. I have come to think that I should set aside whether I like a work or not and recognize that no one can trample on the love that the artist has poured into his or her work. With different nationalities, ethnicities and religions it is simply not possible to measure something through the spectrum of your own values alone. The more people I encountered the more I realized that everyone is different and all of these encounters were precious in their own way. On the other hand, the scope of the people I meet and converse with in Japan tends to be narrower and they are more limited to my own area. Although that is not a bad thing, it probably means that almost unconsciously I see the world through a narrower perspective. In the case of the fieldwork in Indonesia, the opportunity to continuously meet and engage with artists from a different country and different societal situations was something that went beyond anything I could have imaged. It was a truly valuable experience. "Devotion to tradition from beyond the confines of tradition"
A specific example of my experiences in Indonesia is my encounter with the legacy of Sigit Sukasman. At the end of the fieldwork in Indonesia I visited his studio, and although he passed away some years ago, I felt a deep resonance with him. Looking at the puppets that he created by his own hand, you can palpably feel the heartfelt love he had for wayang kulit and how he devoted himself to that art. I could really perceive this love by entering the studio, more than I could have ever done from viewing documents or books. As a painter not born into a family of dalang, or puppeteers, Sukasman gathered together a group of artists and performed wayang in his own style. It has become one of the wayang movements, including the artists who once worked with Sukasman and are still active today. Sukasman's story has elements that are very similar to the activities of the Kinoshita Kabuki Company and elements that I also admire and aspire to. I felt that we shared things in common, but also that there were some aspects in which I could not match up to him. In a certain sense he was an outsider to the world of traditional performing arts, but this was precisely why he was able to act so freely and gather people around him to create a movement that has changed and left a legacy for the history of performing arts in Indonesia. My reaction was to hope that I too could one day come to have such a presence. This was a really precious encounter for me that made me reappraise just what I am doing in my own activities. "Devotion to tradition from beyond the confines of tradition." This is the point I found myself reflecting on frequently throughout the fieldwork. This is what drives the wayang creative team of visual artist Eko Nugroho, and in terms of historical figures, it is also what drove Walter Spies, the famous influencer of Balinese kecak. All of these examples link through to my own activities. Kinoshita talks about his encounters in Indonesia. 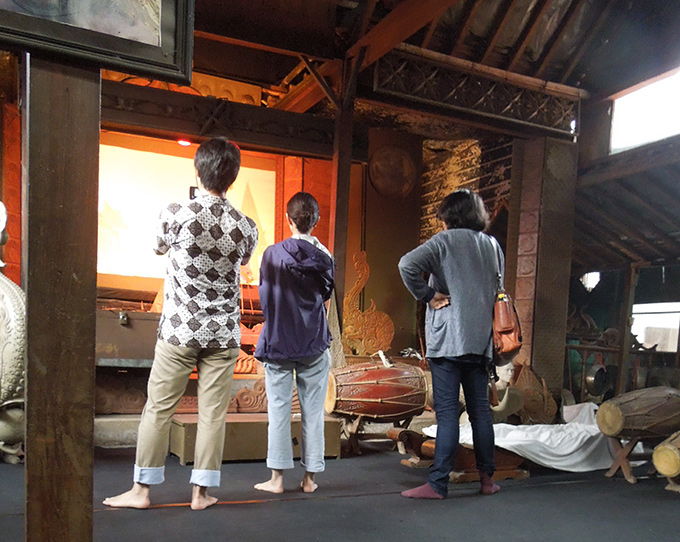 Visit to the Sukasman studio, a place that resonated with Kinoshita. What is a little difficult to admit to in an interview is that if you asked me whether my two weeks of fieldwork in Indonesia had radically altered my creative style, my answer would have to be no. It would be impossible to imagine that it could change so drastically, as it would beg the question "what have I been doing in all my work up to now?" (laughs). What I would like to say is that "my two weeks of fieldwork had an immediate effect!" but that would also not be accurate. What I realized most strongly through my time in Indonesia is that there are many people overseas who are also giving thought to tradition, and that I am not alone. There used to be a person called Sukasman in the city of Yogyakarta in Indonesia, and I understand and appreciate the ideas and hardships that Sukasman experienced. To meet people who share a sense of crisis that unless something is done traditions will wither away, and who are actually doing something in response, was very meaningful for me in that I realized that "I am not the only person concerned about traditions." Until now it was incredibly difficult to be able to experience and interact with such earnest ideas, putting aside for a moment whether they have an immediate effect. To be honest, I don't know whether I felt this because I was in Indonesia, or whether I would have felt the same in a different country. If I had traveled to Europe, I think the outcome would have been different. When the Kinoshita Kabuki Company performed in Paris, the things I felt in France were very different from those I felt in Indonesia. In France the contemporizing of the classics has become a kind of brand in its own right, and there seems to already be a certain level of understanding for the classics. Hence, there is love for the classics. Although there have apparently been budget cuts, the central and local governments in France still provide generous subsidies for such initiatives. While these efforts are superlative, on the other hand I didn't feel the same fervor as I did in Indonesia. In Indonesia everything about the arts was fervent. If wayang dies out, the dalang puppeteers will find themselves out of work. What's more, most of the performing arts are not theater-based, but are instead performed within special communities (in the streets, at festivals and ceremonies). As such, they are linked directly to everyday activities and have developed as part of people's daily lives, which makes it all more difficult to seek out ways to ensure their survival, because you can't simply closet them in a theater and proclaim "these are traditional performing arts!" 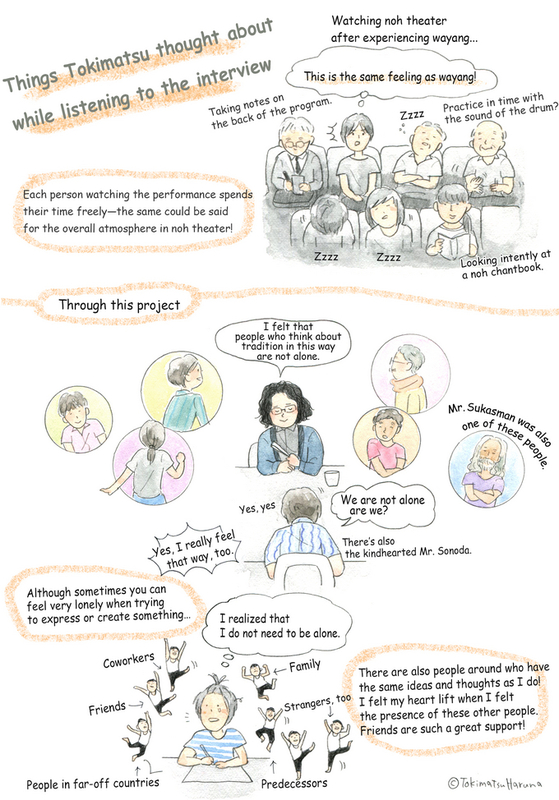 The performing arts and daily life, and the relationship between the performing arts and artists. It is precisely because they are so closely entwined that people are so fervent about them. It was that fervor that struck me throughout the course of my fieldwork in Indonesia. Q3: What are your hopes for the future and also for your own personal growth? What I want to say first is that it would make sense to invite artists from Indonesia to Japan and do a combined performance of Japanese and Indonesian performing arts. That option would be the easiest way to demonstrate a tangible outcome. It would likely increase opportunities for the public to experience such art and would be accessible and understandable. This program, however, focuses mainly on "learning," although we did hold an opening event. As I noted at the beginning of the interview it is a tremendously valuable experience, but one that may seem extravagant. Accordingly, I feel a great sense of responsibility, as if I have taken on a great debt. 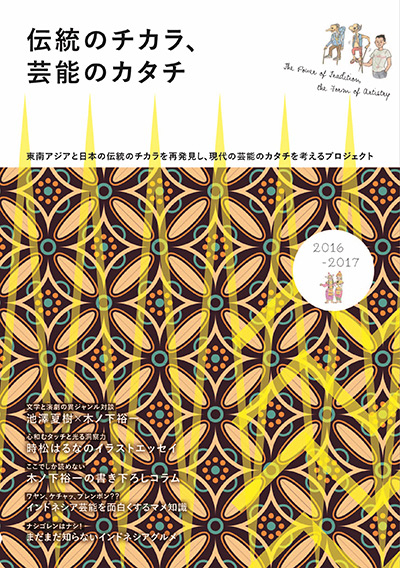 In FY2017 we plan to invite artists from Indonesia to Japan and show them various different things and engage in discussions with the aim of further deepening understanding. We are also planning events and are in the process of compiling a booklet that details our activities over the past year. However, as this is first and foremost a learning project, there will not be immediate outcomes. It would be extremely hard, if not impossible, to present in a tangible way the overwhelming skills I have accumulated as a result of the past year's activities. But, nonetheless, and just as I strongly felt in Sukasman's studio, what will remain from this project is people. Although Sukasman's puppets are still with us, there is no record of his works and performances. However, the people who worked with Sukasman share in his legacy and are currently working to pass on traditions. Ultimately, if you want to do something to help performing arts, the first thing you need to nurture is people. Performing a work is challenging and requires a great deal of energy, but it is over in a single evening. 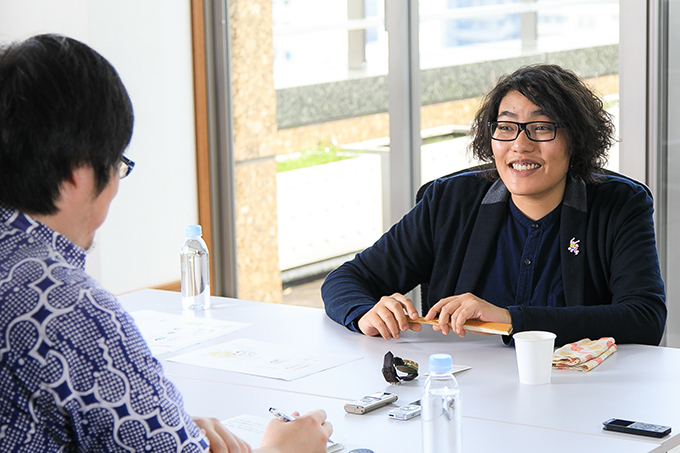 Although there is of course value in such single moments, the Japan Foundation Asia Center's spirit and initiative to engage in a bold attempt to nurture people, encourage them to think and develop discussion is truly inspiring! Around the time of the 2020 Tokyo Olympic and Paralympic Games it is likely that culture-related budgets will change dramatically. It is precisely at such a time that people are so important. This project is all about mutual exchange and sharing the realization that "we are not alone; we are not isolated." I am sure that this project will be a great source of power for artists. 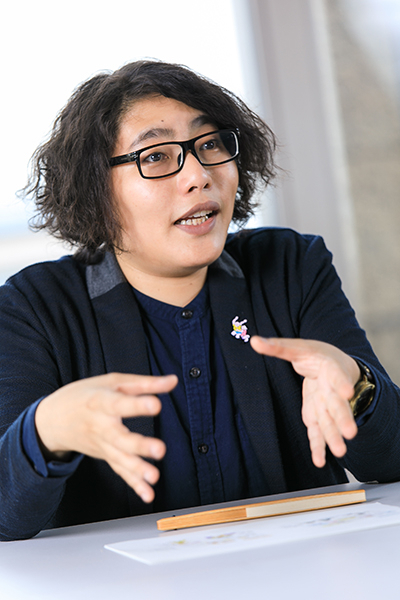 Kinoshita talks about the importance for the arts of nurturing people and engaging in exchange. Answering the question from the perspective of my own activities, I would say that the way I divide my time has changed, specifically the way I devote time to creating a work. My performance activities in Japan are tightly packed into an exhausting schedule. I get caught up with the feeling that "once this is over there is the next performance and once that one is finished it is on to the next." Before you realize it your own perspective gradually becomes narrower and narrower. Through the study group, fieldwork and conversations that I have participated in since last year at the Asia Center, I have found it extremely positive to have been able to deepen discussion in one area. More than that, it has actually also had an impact on my own creative processes. By spending time focusing on one theme in this project, I have realized that information I once thought to be irrelevant is unexpectedly of great importance. This kind of insight is what I have learned through firsthand experience on this project. That is what has been most significant for me. Until now I had wanted to spend a full year creating a work, but I found myself unable to devote so much time. However, having learned the importance of spending time on each endeavor, I will start trying to use my time wisely. Until now I always aimed to get where I wanted to be via the shortest route. In fieldwork too, I simply visited only the areas I thought to be relevant. However, instead of dashing around historic sights, it may actually be more rewarding to simply lie back and take in the view of the Seto Inland Sea. That is something I realized in Indonesia. Although a visit to a museum may be good, it is also important to simply spend a relaxing two hours lost in thought while being wafted by the breezes in Yogyakarta. The things I have gained from this program that Yoshiko Maeda and Yu Endo of the Asia Center spent so much time and effort in compiling have been truly meaningful. I must also talk about the importance of passion. Ms. Maeda and Mr. Endo love the traditional performing arts of Indonesia and their passion really comes through clearly. This is very important because it made the project so accessible for me and I was able to become familiar with it very quickly. Kabuki, bunraku and noh all have specific techniques or "forms." These forms have been passed down through the generations and they represent what could be termed the greatest common denominator, namely "if you do this, then you are able to express all these other things." Forms have been passed down as a basic technique, which, if you follow it properly enables you to go further. At the Kinoshita Kabuki Company we practice by copying these forms precisely. We also make the actors in contemporary theater copy these forms and although at first they may have difficulty in copying them, as they continue to practice they begin to realize why the forms dictate that you move in a certain direction, or the reason why hands are moved in a certain way. In other words, what the actors thought to be forms of classical performing art, are all based on realism and actual body movements. These forms could be likened to frozen foods―if you eat them as is they do not taste good, but if you leave them out too long they will rot. What I am trying to say is that "heat" or "passion" is necessary to thaw the forms. What kind of heat and extra arrangement is required to make something taste even better? I think that forms can be said to be things that are passed down through generations through a repeated process of thawing and freezing. Although the analogy of thawing and freezing is not one I thought of in Indonesia, I think that many of the realizations I experienced in Indonesia have influenced my overall way of thinking. When I look back now, I can see various examples of thawing in Indonesia. Within the genre of wayang puppetry there are various forms. For example, in some forms the two-dimensional puppet has been transformed to become three-dimensional. In the Sukasman studio I saw leather puppets that had been overlaid with color. In Bali, the puppets of Wayan Wija have transcended the concept of leather puppets. His difference in style represents a thawing process. He said he started doing it when he was young and was criticized by others, but this did not perturb him as he viewed his puppets as his own version of wayang. This demonstrates the great diversity of thawing methods. Among the various thawing methods I saw in Indonesia there were some that weren't to my own personal taste, but I learned that one way is not the only way. The same can be said for the work of Mr. Ikezawa, in that his method of thawing traditions is to have artists retranslate classical Japanese literary works. What all of these examples have in common is that they need the "heat" that comes from passion to thaw something. Without heat, thawing is impossible. I think it is the case that as I have learned about each thawing method I have become more accepting and tolerant of other people's works. While works may take on different shapes and forms, this is simply due to the differences in what the artist considers to be important. 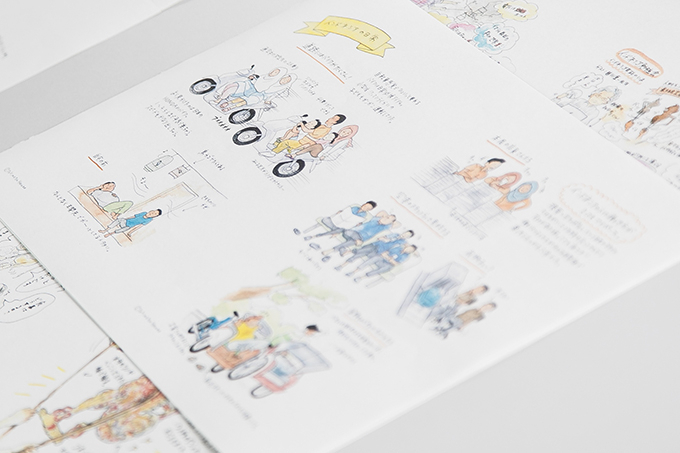 Haruna Tokimatsu depicts the interview in illustrations and text. 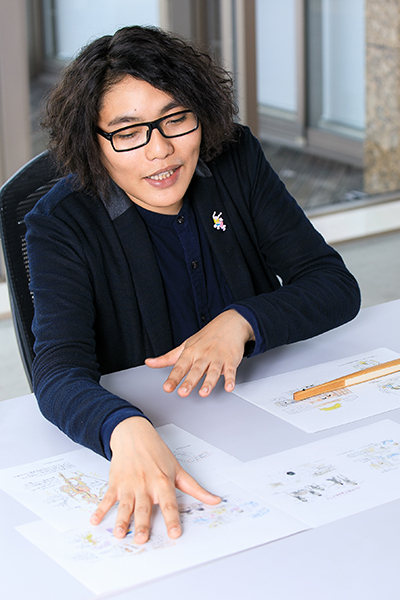 Haruna Tokimatsu illustrates her experiences of "The Power of Tradition, the Form of Artistry" program in pictures, describing the processes involved in the program's activities. Ordering: Information on how to purchase a copy is posted on the "News" page of the program's official website! Yuichi Kinoshita was born in Wakayama Prefecture in 1985 and is the leader of the Kinoshita Kabuki Company. When he was in the third grade he heard a rakugo performance for his first time and was heavily influenced by it. He began to study this art on his own, and later expanded his study to include other traditional performing art forms while also learning about contemporary performing arts. In 2006, he founded the Kinoshita Kabuki Company, where he directs performances from the classic repertory and rewrites old scripts. His representative works include Kurozuka, Tokaido Yotsuya Kaidan, Sannin Kichisa, Shinju Ten no Amijima, and Yoshitsune Senbon Zakura. In 2015, the Kinoshita Kabuki's revival of Sannin Kichisa was nominated for the prestigious 2015 Yomiuri Theater Award for Best Performance. He is also the winner of the National Arts Festival New Artist Award for Kanjincho, performed in 2016, and in 2017 he received the 2017 Kyoto City Special Bounty Program for Art. He received his PhD in 2016 (Doctor of Arts). Since 2016 he has been participating in the Japan Foundation Asia Center's program "The Power of Tradition, the Form of Artistry." He is also engaged in a wide variety of activities, including writing about and teaching various traditional art forms. 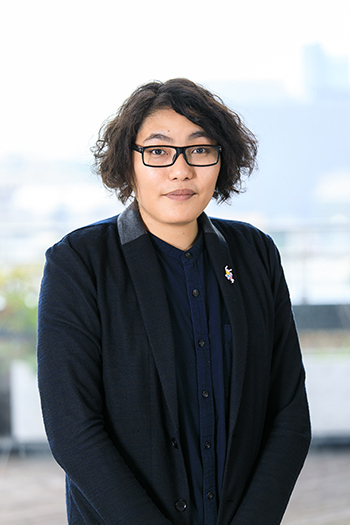 Sonoda is a theater writer, editor and editor-in-chief of the theater magazine BITE. Since the beginning of the 2000s, he has participated in the administrative side of productions, gaining experience in everything from small theaters to large commercial productions. In 2005 he joined the editing staff of the theater magazine Engeki Bukku (Theater Book), and conducted countless interviews with playwrights, directors, actors and theater staff, reporting on the cutting edge of the contemporary Japanese theater scene. Since then, he has seen upwards of 150 to 200 theatrical performances a year, from Tokyo to the far reaches of Japan. After serving as deputy editor of Engeki Bukku, he founded BITE in order to bring exposure to the smaller theater scene that is often neglected by mass media, and lay fertile ground for audiences to engage. He remains active in many areas, writing for specialist theater-related publications, programs, websites, and free newspapers, as well as participating in theater contests and other related activities. Since FY2016 he has been participating in the Japan Foundation Asia Center's program "The Power of Tradition, the Form of Artistry."